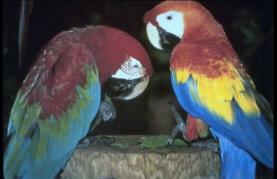 The diet of the Amazonian macaw is made up primarily of seeds. These brightly colored birds, found through the rain forests of the Amazon, dextrously pluck fruit off trees, tear it open and dig out the hard seed at the center. No seed seems to be too hard for the bill of the macaw to crack, and their diet is quite varied, from the seeds of the mahognay to those of the rubber tree. Macaws are curious birds and will try to eat just about anything resembling a seed that they can get their beak on. But this could lead to serious problems in the rain forest, where some of the deadliest poisons in the world are manufactured by its botanical inhabitants. Charles Munn has been studying macaws for years and he asserts that many of the seeds macaws eat are in fact toxic, particularly in the dry season, (August through September), when the picking are especially slim. So, how then do these birds survive this fatal fare? In his years of watching macaw behavior in the Amazon, Munn noticed that the birds spent at least two to three hours per day at a clay and mineral lick along a riverbed. He was able to identify how often birds went to the lick and how much time they spent there by using the distinctive facial markings of each bird as an identifying charcteristic. At first, Munn thought that the birds were just using the clay lick to obtain minerals their diet might not otherwise provide. But the discovery by one of his graduate students of the toxic elements in the seeds made him rethink his ideas. Now Munn postulates that these birds counter the tannin and alkaloid loaded seeds they eat by spending time daily ingesting clay. This strategy, which is also used by Indians in the high Andes, helps to detoxify the birds by binding to the compounds and aiding in their elimination from the body.Current research is being done by Munn's group to isolate and analyze the specific toxins found in the seeds. In the meantime, Munn has been promoting the salt licks as a site for ecotourism, in hopes that the money and publicity generated from this industry will encourage the government to enforce measures to halt the pet bird trade and hunting of these endangered birds.